SHARPE VALVES Series V84 Control Valves have double stem packing for live loaded stems. In addition, Sharpe® offers a wide range of seat materials for high temperature, chemical and abrasive applications. A variety of characterized V ported balls are available in 15º, 30º, 60º as well as special configurations upon request. The V84 is available from 1/4″ pipe size up to 4″ and is offered in 316 grade stainless steel, carbon steel as well as several corrosion resistant alloys including Alloy 20, Hastelloy C and Monel. The V84 utilizes characterized V ported balls, permitting the use of soft seats which results in low torque, and ANSI class VI shut off. To cover a vast array of application needs, the V84 is available with Nova, PEEK, TFM, Reinforced TFE, TFE, Delrin, UHMWPE seats. These seats can easily be changed in the field. 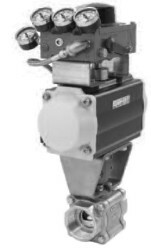 For high temperature and slurry applications, Sharpe® Valves offers the V84 with metal seats. Tight shut-off eliminates the need for isolation valves. Additionally, end connections are stocked in threaded, socketweld, buttweld and 150#, 300# and 600# ANSI flanged. The V84 has several features to eliminate hysteresis. Tight shutoff between the ball and downstream seat eliminates the need for a separate stop valve. A “No Play” coupler is utilized to eliminate clearance/looseness between the actuator shaft and the valve stem. Ball-to-stem tolerances have been tightened to further reduce free-play. PH control, Steam control, Temperature control, Level control, Pressure control and Flow control. PH control normally requires controlling low flow rates with particulate and some solids in the flow media. The series V84 control valve is an excellent selection for this service. With its inherent self cleaning ability due to the sliding of the ball over the seat, any solids that normally clog other types of valves are easily washed away. The excellent rangeability of the V-port ball provides the capability for broad process flow control. Steam control for low to mid range temperatures is another application for which the V84 is well suited. Unlike rising stem valves which can drag corrosion products through the packing causing early failure, the V84 ball valve with its rotary seal design, eliminates this problem. In addition, because the ball and downstream seat seal bubble tight, steam loss through the valve is no longer a concern; a downstream block valve is not needed. Level control is easily accomplished when using the V84 ball valve. The range of V-ball options available provides not only high flow capacity for quick fill but very controllable low rates for make-up flow rates. Sharpe® Valves stocks 15º, 30º and 60º degree characterized balls as a standard. We also maintain a supply of solid balls (Blank Ball) that can be EDM cut to your requirements. For those applications, please contact Sharpe engineering department.